Recently, I was shipped a temporary evaluation unit for the ioSafe SoloPRO. 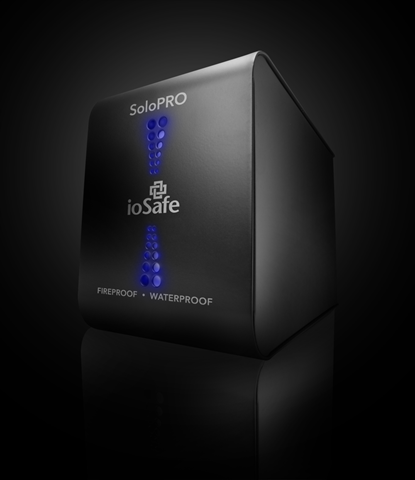 I checked out the ioSafe Solo product in an earlier review. These drives are pretty cool. For one, they are HEAVY at 15 pounds. That is good to know in case of a fire or flood that the internal drive will be protected. The SoloPRO series includes an SSD offering, but the unit I will be using for the eval is a 1TB SATA drive. The ioSafe series of products also include a Disaster Recovery Service, DRS. This offers you a robust recovery of your data should the drive go through a disaster – or simply fail. This could be due to a drop, disaster or even human error. ioSafe doesn’t make their DRS service projects public, but I’ve been told that they have never had a customer data request that they couldn’t meet. Look for more on this cool new product, as I’ll set it up in the Rickatron Lab this week!